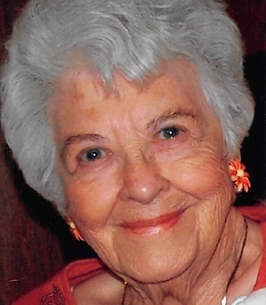 Thelma M. Bush Haralson, born April 30, 1919 in Independence, MO, and died October 30, 2018, in Independence, MO. (99 years 6 months). A visitation will be held on Friday, November 2nd from 1-2:00pm with a service following at 2:00pm, both at Speaks Suburban Chapel, 18020 E 39th St., Independence, MO 64055. Interment will follow at Mt. Washington Cemetery. Thelma was born to BF (Frank) and Eva Imboden Bush and married Walter L. Haralson on October 12, 1940. He preceded her in death on August 9, 1988. Thelma lived her entire life in Independence. She worked at Pratt & Whitney during WWII and was a “Rosie the Riveteer”; later working many years at Bendix and retiring in 1984. She enjoyed traveling (and fishing) and reading and was also proud of her many ancestors, especially her grandfather BF Bush, a noted botanist. Thelma is survived by her children: Donna Fleeman Sheets, William L. Haralson, Gloria Haralson Smith, and Gayle Haralson Cupp Watson; grandchildren: Kristi Barlow Littleton, Shari Rinehart Caswell, William Ryan Haralson, Michele Cupp Fry, Lori Cupp Davis, Scott Alexander Smith plus 10 great grandchildren and 4 great-great grandchildren. She is preceded in death by her husband, Walter and her grandchildren, Mark W. Barlow, Michael W. Barlow and Vicki R. Barlow Miller. Family wishes to thank caregivers: Kim Thompson, Ann Miller, Kristy Chance, Carol Brimer, Heather Holtmyer, Becky Muelleman, and Lisa Perry. In lieu of flowers, family requests donations to Animals Best Friends, P. O. Box 493, Independence, MO 64051. To plant a tree in memory of Thelma M. Haralson (Bush), please visit our Heartfelt Sympathies Store.